The Devil’s Own. Photo by Len Villano. Recently I witnessed a bartender “dry shake” ingredients in order to create a beautiful, creamy-looking cocktail with a frothy head. Ever since, I’ve been itching to try the technique myself. “Dry shaking” involves vigorously shaking an egg white with chosen cocktail ingredients in a cocktail shaker sans ice, preferably at room temperature. This ensures the egg white is fully incorporated and creates that dreamy, foamy texture. The concoction is then shaken again with ice before straining to serve. For our winter edition of In Your Glass, I adapted a recipe from a cocktail called The Devil’s Own, by Los Angeles bartender William Cutting, which uses the dry-shake technique. The resulting cocktail is tart and slightly sweet, with underlying flavors of smoky, barrel-aged bourbon and rich maple. To make the drink extra special, I incorporated two local ingredients. 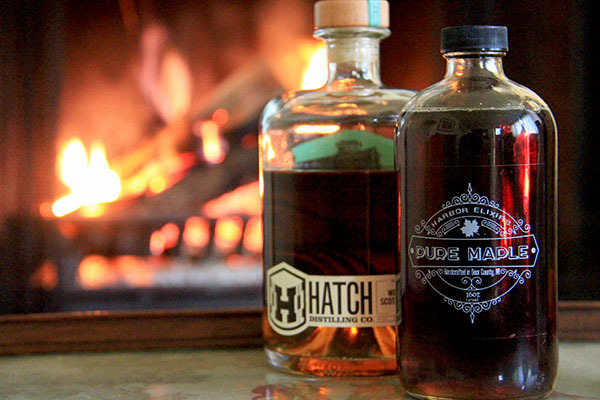 The spirit of choice is Hatch Distilling Co.’s whiskey. While its signature brand of whiskey is in the works (target date of 2020), Hatch has bottled a batch of 100 percent corn mash bourbon from Yahara Bay Distillery that has been aged two years and then eight months more in a Glenglassaugh scotch barrel. Another option currently available is a straight bourbon from Death’s Door Spirits that uses a 54 percent corn and 35 percent rye mash. Either spirit would do well in this cocktail, but the Hatch whiskey imparts a smoky essense from the barrel aging. For this recipe, I’ve used Harbor Elixirs’ maple syrup. Michelle and Bryan Rasmusson have been creating this syrup for the past 10 years using sugar-maple sap from Baileys Harbor, and they recently began bottling and selling it in locations around northern Door County. Sold in sleek, 16-ounce bottles, this maple syrup is savvy enough to go from breakfast waffles to cocktail hour and beyond. Each bottle is stamped with an all-white, Prohibition era-inspired logo, making it appear right at home on your bar cart. Make a toast this winter to the birds and the bees, and the sugar maple trees, that have brought us this bounty of local flavor. 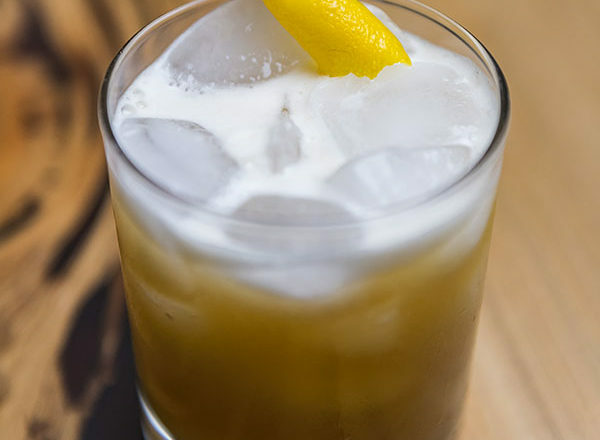 Add whiskey, lemon juice, maple syrup, marmalade and egg whites to cocktail shaker without ice. Dry shake for 15 seconds until the liquid feels light and fluffy. Add one scoop of ice to shaker and shake for an additional 10 to 15 seconds. Double strain using a mesh strainer into an old-fashioned glass filled with ice. Add 2 or 3 dashes of cardamom bitters and stir. Garnish with a twist of lemon peel. *Consuming raw eggs may increase your risk of foodborne illness.